There is little like the satisfaction, no that is to tame a word, the exhilaration of solving a problem that you had never addressed before, or thought you could not figure out. That is no great revelation. In the realm of technology, such small peaks are commons. Maybe some people do not make a big deal out of it. But when things you try go south, do they ever do deep down the ordinate axis. When this happens to me, even if it is not super consequential, it continually grates at me, and erodes away at the fragile layers of confidence I try to stay atop of. So here is a cycle, but I actually first want to show an illustration of it via today’s You Show Daily Create Your Story as a Historic Constrvtion Cit. Use the Historic Tale Construction Kit to generate an image that depicts a challenge you have overcome or something else you might place in your portfolio or online representation as a metaphor for something you have done. 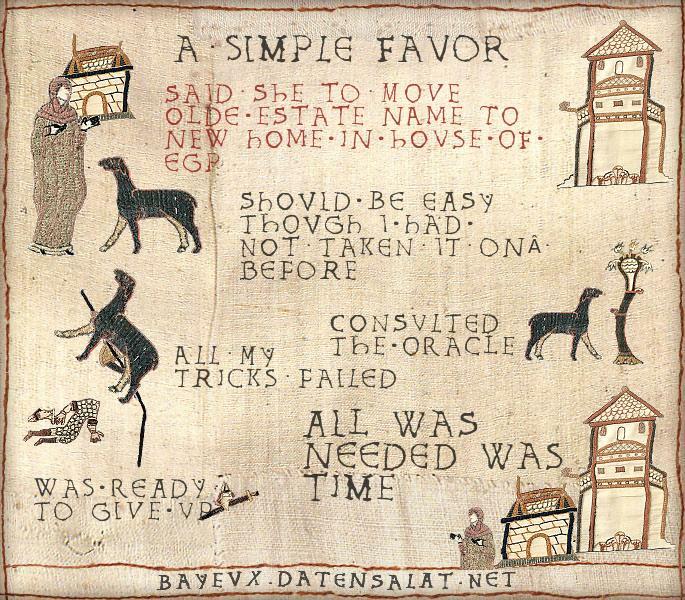 The elements in the tool are from the Middle Ages era Bayeux Tapestry that depicted the 1066 Battle of Hastings. (I have to say I had quite a few downs trying to use the tool, the text editor gets really funky when you hit the delete key, I had 4 times where it actually sent the browser back to a previous page, wiping out my work). So here is the story. Last year I did a web site redesign for a nifty organization in North Vancouver, the Edible Garden Project (EGP); it involved transferring an older site to a new hosting provider, doing a complete make over, but most importantly, setting them up as clients so that I become not needed. I set up their site as a WordPress multi-site, which means its easy for them to spin out new sub sites (they have done at least two since my part ended a few months ago). They contacted me last week because that had done this to create a site for a smaller affiliated non profit group, so the new site was sitting at xxxxxxxxxx.ediblegardenproject.com But what they wanted to was to make their current domain point to this new site hosted at EGP. They thought all they needed to do was to change the name servers on their domain registry, but I did know that would not work. This should not be too difficult. But any time I deal with a DNS change, my guts go queasy, because it seems like my understanding is like looking into some mystery box of magic. I have vague hunches, I spend extra time sorting out the conflicting kinds of information you find online, and rpetty much use a time honored solution– just keep trying til it works. I know with multisite there is a way to do it via domain mapping, it was running on the ds106.us site, Jim Groom has blogged about his adventures with it. I found a pretty clear tutorial on how to do it. But I thought maybe a simpler solution, one that avoided trying something new, was to export the WordPress site EGP had set up as a multisite, and make it a standalone install. That way, I could just set up the new domain as an add-on one in cpanel, and everything would be ok.
Easy. Well, on the cpanel I am used to. The one for EGP seemed to not be set up to allow add-on domains. This plunged me into the world of WHM, which is the broader site manager. It looks like the cockpit of a 747. I fumbled around for a while, not quite finding the right place to enable this. Zig, than zag. So I went back tot the codetuts tutorial on domain mapping, conferred a bit with D’Arcy Norman who was here visiting (he confirmed it was not hard to do). It was not too difficult to do, but how would I know it would work? The domain needs to know to look for a new server. Ah this is one i do know. If you know how to edit the hosts file on your computer, you can test out a new host before you have updated its nameserver entry (this is the big magical box that takes a request for alphabetic domain name, like goofydogmessup.org and tells it to look for it at its real IP address, a numerical one like 245.34.23.107). if 245.34.23.107 is the numerical IP address where the new site resides. Then if I enter http://goofydogmessup.org in my web browser, it uses the server address i entered, which might be different from its current address everyone else sees. This worked. So I deleted the entry from my hosts file, so I could test it like everyone else would see it. To make it work on the EGP site, if I understood correctly, I could “park” the domain at edibblegardenproject.com which means when name servers are updated to point the domain at the EGP nameservers it would say, “Yup. That site is here”, in essence the new domain points to the same web server (WordPress Multisite) that hosts EGP. The domain mapping plugin than connects it to the correct subsite. So I told the folks to switch the nameserver. And I waited 24 hours. I got the dreaded cgi-sys/defaultwebpage.cgi URL, which means I *****ed Up the DNS. Rechecked everything. Confirmed the DNS Zones. Clicked a something that said Renew DNS Zones. A few hours later, I checked. It had to be like 36 or maybe 48 hours. Still not coming up. Just for grins I restarted the web server. Hey, it works for most machines. And the next day… well it worked. I think it was a matter of time. In just relaying this back, it seems almost trivial. But the aspect of having something remain broken that I feel I should be able to fix, just slowly gnaws away. It starts stabbing down into my subconscious. And getting it to work (or just waiting), zings me way up that curve. It’s more than just balancing the ups and downs. You just cannot beat the ups. Except when you are down.